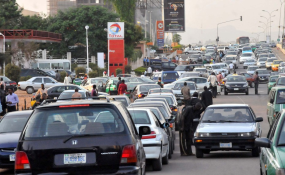 Nigerian motorists queue for fuel. In what appears the worst fuel crisis in the country in recent history, petrol users in Nigeria have for two months faced an unending scarcity and price hike of the product. The confusion is amid rising prices in filling stations and a Nigerian National Petroleum Corporation, NNPC that seems bereft of ideas on any immediate solution. The fuel scarcity has continued despite proclamations by the petroleum minister, President Muhammadu Buhari; the minister of state for petroleum, Ibe Kachikwu, the NNPC chief, Maikanti Baru; and other officials. A committee set up by the president and headed by Mr. Kachiwku has also failed to put an end to the crisis. The queues first resurfaced across the country about two months ago in early December 2017 in the wake of a threat of strike by the Independent Petroleum Marketers Association of Nigeria, IPMAN. Since then, and throughout the Yuletide period, the crisis has persisted, with long queues of anxious motorists, a common feature of most retail outlets. The NNPC and the fuel marketers have continued to trade blames on who is responsible for the scarcity, resulting in rising retail prices averaging about N200 per litre in most states, except Abuja and Lagos where filling stations in the metropolis sell for N145. While the NNPC accuses the marketers of sabotage by diverting supplies to the hinterland and across the borders to neighbouring countries for profiteering, the marketers in turn blame the NNPC for not having sufficient stock to take care of growing demand. This week, the long queues worsened across the country following another threat of strike by the Petroleum Tanker Drivers, PTD. In the Federal Capital Territory, FCT, Abuja most filling stations did not sell petrol to consumers. The few stations that opened, particularly the NNPC mega station, and Conoil and Total filling stations opposite the NNPC Towers in the Central Business District had long queues of motorists. In the outskirts of the city, the few independent outlets that had products were selling at prices above the approved N145 per litre price. Most motorists who could not bear the agony of the scorching sun found an alternative in the emergency roadside fuel hawkers. But this came at a higher cost of about N2,500 for a gallon of ten litres, with the attendant risk of buying adulterated products. In Plateau, long queues of motorists scampering for fuel at government approved pump price of N145 have continued at the few filling stations selling at that price, including the NNPC mega filling station. Some of these filling stations include Cherry, NNPC, Mobil filling station near Plateau State Polytechnic, Jos Campus, and Kim filling station. For residents not willing to spend hours at such filling stations, many others were selling at higher prices, without queues. A filling station "Infinite-Plus" located along Bauchi ring road Jos, on Wednesday, was dispensing fuel at N200 per litre. There was no queue there. Also, Jeney filling stations located along grand serial Oil mills, on Jos/Abuja express-way has continued to dispense petrol at N200 since the scarcity began. Filling stations such as Basaco, Bok filling station located along Bukuru express way and Oando at Tudunwada ring road have continue to dispense fuel at N195 per litre. As a result of the persistent fuel scarcity, transportation fare has increased in Plateau. A five seater car from Jos to Bauchi is now N1200 per passenger, rather than the former N800 Naira per passenger. Similarly, taxi fare within Jos metropolis has increased by about 100 per cent. The situation in Lagos may not be as chaotic as other parts of the country, but most filling stations with products were selling above the official price of N145 per litre, PREMIUM TIMES observed. In Agege and environs, stations are dispensing fuel at prices between N180 and N200. A few stations were not dispensing. In Abule-Egba, our correspondent reported that most filling stations had no products to sell to customers. The few that had were selling above the N145 price threshold. Most commercial bus drivers were going about with jerry cans to take advantage of any opportunity they find the product to buy. In Sango Ota, Ogun State, most filling stations were equally not dispensing products to customers. Some private filling stations with products were selling for between N180 and N200, with fuel attendants collecting additional 'toll' of between N50 and N100, to guarantee access, with additional fees on the number of litres customers want to purchase. In Ondo, after the state government failed in an attempt to force marketers to sell petrol at the regulated price, filling stations appear to have introduced a new fuel price regime that has come to stay. For instance, most of the retail outlets, like Mercyway, Segadot and Damorotex fuel stations all along Oda road Akure now sell the products at N180 per litre. Consumers appear to have resigned to fate with the N180 per litre price, as most of them told our correspondent it was a better deal than the N220 they were paying at the peak of the scarcity crisis during Christmas. Although the NNPC Mega Station along Akure-Ilesa road and Bovas were selling at the regulated price, they usually have long queues of motorists to contend with. In Ekiti, the situation is not different, with only NNPC and Bovas filling stations selling the product at N145 per litre. Other stations were selling at N180 per litre. Like other parts of the country, there were long queues of motorists at the few major petrol stations in Taraba and Adamawa states, with fuel hawkers cashing in on the situation to make brisk business. In most of the towns, motorists faced difficult times as the fuel scarcity bit harder. A four-litre gallon of petrol now goes for as high as N1,800, while most filling stations remained under lock. Vehicle owners spend most of their day on endless queues at the NNPC mega stations in Jalingo and Yola, the only places where fuel is sold at the official pump price. Few of the fillings stations at the outskirts of the town operated by independent marketers only sell their products at hiked prices of N200 per litre, mostly at night. The fuel scarcity has forced residents to adopt new ways to cope with the difficult situation. A school teacher in Jalingo, Bello Ya'u, lamented that he hardly drives his car to far distances these days due to high cost of fuel. In Yola, apart from the mega filling station that sells at N145 per litre, independent marketers' filling stations sell for between N180 and N200. The situation is same in Bauchi State, where most filling stations within Bauchi metropolis were not dispensing petrol. Only the NNPC Mega Station in the metropolis sold fuel at the regulated price of N145. Motorists along the Bauchi/Jos road were forced to but petrol from black marketers at N190 per litre. In Kaduna and environs, the Department of Petroleum Resources, DPR, blamed the perennial fuel scarcity in the state on inadequate supply of petroleum products from the NNPC. The zonal operations controller, Isah Tafida said the state received an average of 30 trucks of petrol every day, saying this was insufficient to meet the normal demand level of 70 trucks per day. Mr. Tafida said despite efforts by DPR to monitor the distribution of petrol in the state in collaboration with the security agencies, especially civil defence officers, diversion of received allocation still persist, resulting in the scarcity the public is experiencing in the state. "We are appealing to NNPC and PPMC to increase the supply of petrol to Kaduna State and environs in order for the queues to disappear and normalcy restored," Mr. Tafida said. He said 18 companies have been sanctioned for fuel diversion; 30 companies that hoarded fuel forced to open and sell, 50 companies selling above pump price penalised and made to pay fine, while 80 others were sanctioned for under-dispensing fuel. Rather than address the root cause of the crisis, the NNPC seems determined to continue to paper the cracks. Ndu Ughamadu, the corporation's spokesperson gave a similar statement to what he has been saying since the scarcity began in December. "The same quantity of fuel being pumped into Abuja today is what has always been sustained over the years. How come this time around, when the same volume is pumped it will disappear? he told PREMIUM TIMES on Wednesday. "Yesterday (Tuesday) an average of 140 trucks of petrol were pumped into Abuja, compared with 100 trucks in the past. Yet, most filling stations still say they don't have fuel. Where have those trucks gone to?" Mr. Ughamadu said apart from Kano, Kaduna and Calabar currently experiencing queues, the rest of the country "was relatively okay, in terms of supplies." He blamed the high prices of petrol in most states on what he calls "internal and external diversion by marketers", where products meant for certain places are usually diverted to other areas where they can be sold above N145 per litre. Also on Wednesday, the NNPC arrested some marketers and hawkers for allegedly diverting and hawking petrol in Abuja; similar measures it has been taking since December but which have failed to solve the problem. In his reaction to the unending fuel scarcity, the Speaker of the House of Representatives, Yakubu Dogara, proffered what he considered the only solution to the problem. Mr. Dogara said local refining of crude is the only way to make fuel available and easily accessible to all Nigerians. None of Nigeria's four refineries has worked optimally since President Buhari assumed office almost three years ago. The speaker said every other measure to put an end to the recurring problem of fuel scarcity will only work temporarily. For others, the permanent solution is to completely deregulate the petrol sector. "It's time to LET GO of the "politically beloved petroleum sector". Sir, the SOLUTION is FULL DEREGULATION. Just. Do. It!," a former minister Oby Ezekwesili said in a series of tweets directed at the president.